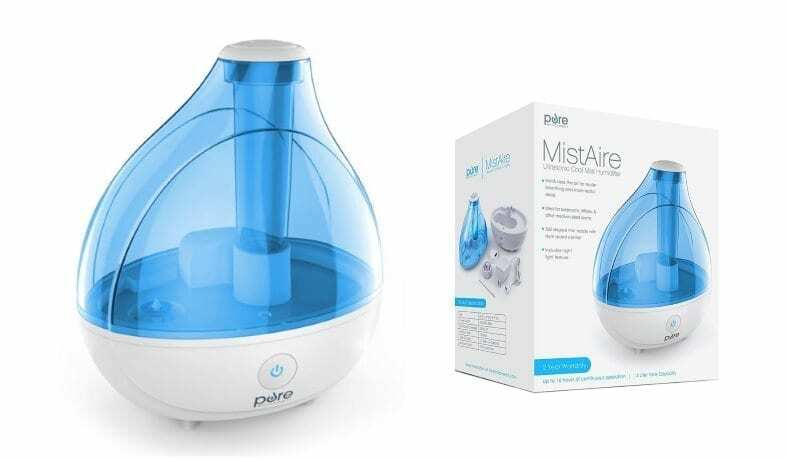 Home » Buyers guide » The Best Filterless Cool Mist Humidifiers – 4 Great Buys For The Money! I’m a huge fan of humidifiers and I love how mine relieve my dry skin & nose. The problem is that there are so many to choose from that it’s very hard to pick the right one! Without knowing which ones are best, you’re likely to end up with a terrible one that doesn’t perform well. Even worse, you could find out later could have gotten more for your money. 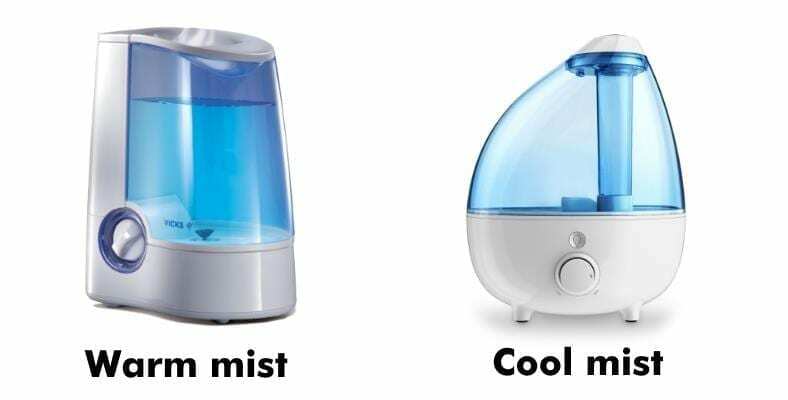 To help, I’ve got a great list of the best filterless cool mist humidifiers. Each one is an excellent buy and will give you the features, value, and relief you deserve. 2. How does a humidifier work? 6. Where should you put a humidifier? 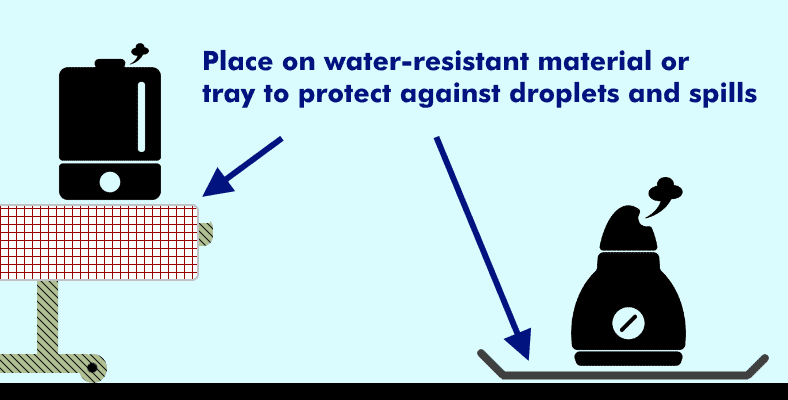 Diagram showing how a typical humidifier works along with the major parts & sections. While the details vary from model to model most share the same basic design. They also have the same job: humidifiers convert liquid water stored in a reservoir into a fine mist which increases the humidity level in a room. 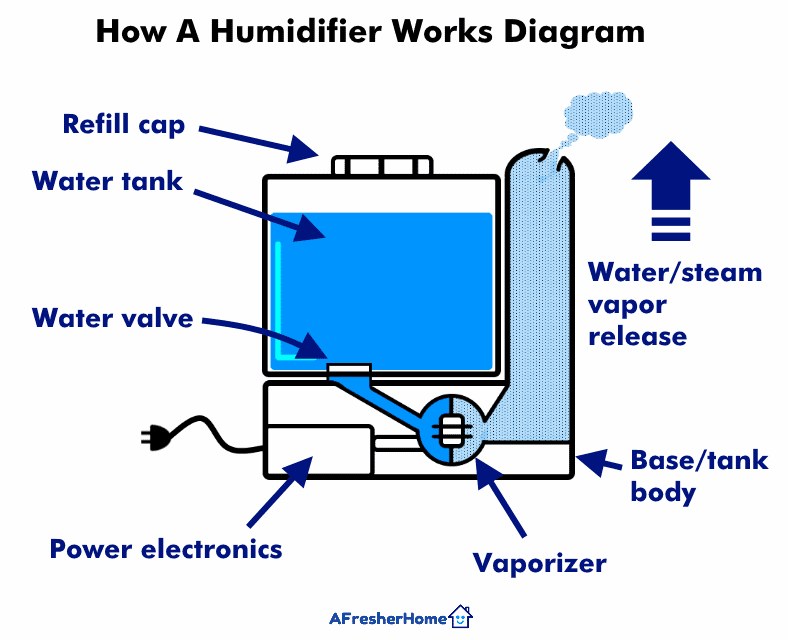 Wondering how a humidifier works? Here’s a simple definition: A humidifier coverts liquid water stored in a reservoir into a fine vapor mist it releases into the air. This replaces the missing moisture in a room’s air and raises the humidity level. Electro-mechanical types using an electric motor and fan-like blades are still available today but are much more rare. These were more common years ago. 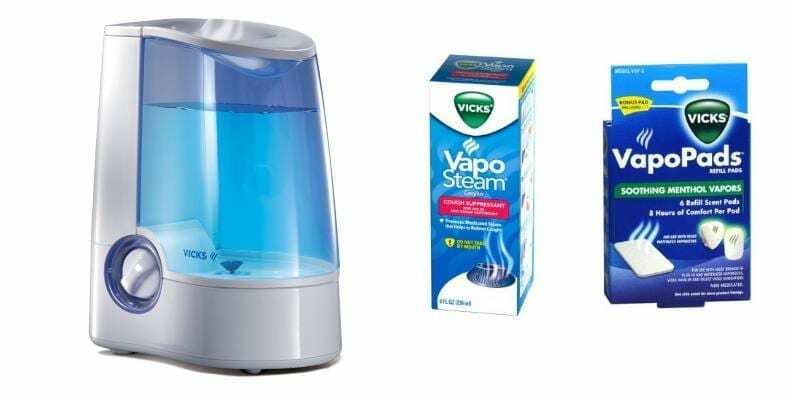 What is a humidifier vaporizer? The vaporizer is a part or assembly of components that changes the liquid water into a mist or steam. In the case of warm mist models this works by heating the water to a point where it changes to a gentle steam. Ultrasonic vaporizers are common in cool mist models and work by rapidly exciting water. This creates a very fine water mist that rises in the air without the use of heat. Filling a cool mist humidifier’s water tank is part of the job. In nearly all cases you’ll need to occasionally fill the water tank after it runs out during use. 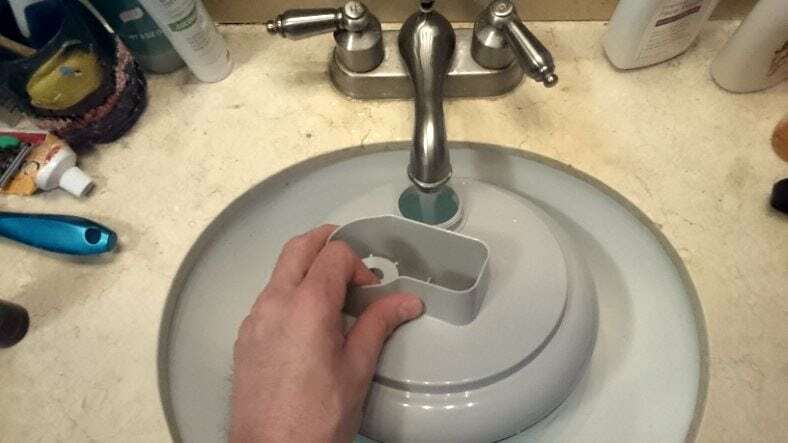 To do so, you’ll remove the tank, unscrew the fill cap, and fill it as recommended with fresh, clean water. In nearly all cases mineral-heavy water is not recommended! Refilling the water tank is needed periodically as it takes several hours before the tank runs out of water. You can expect about 9-24 hours between refills for most. However it greatly depends on the model you buy as well as the output level you set yours to. Because of this, it’s important to remember that buying the cheapest often isn’t the best decision! If you hate hassle and having to keep up with an appliance like me, considering picking a model with a large water tank. In my opinion the extra run time between refills is well worth it. That’s especially true for overnight use in which you’ll want to use it for 8-9 hours or more continuously. As I mentioned earlier the two most common types of humidifiers sold today are warm mist and cool mist models. While they often look very similar, there are pros and cons to each depending on what your needs are. Because of this it’s very important to know the differences. Warm mist models look very similar to cool mist units. However, be aware of the differences! 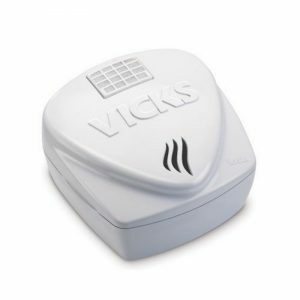 For example, warm mist models like this very popular Vicks warm mist product produce water vapor using warm steam. Great for colds, some feature support for drop-in medicated liquids or medicated pads to distribute sinus & cold relief in the air. Cool mist products can’t do this. Basically the opposite to cool mist products, warm mist humidifiers use heat to turn liquid water into a heated gentle steam vapor. Not all but some models offer the option to use medicated menthol pads or drop-in vapor liquids which get released into the air. This helps boost their cold, sinus, and congestion relief that the warm steam already provides. The drawback is that they raise the temperature in a room due to the use of heat, although it’s a gradual and not a huge amount. They’re great for winter or moderate temperature environments and can really help with congestion during sickness. 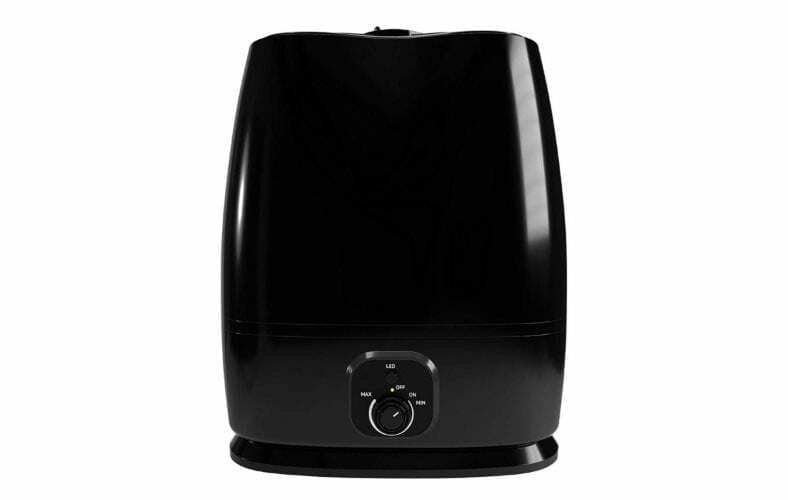 Warm mist humidifiers do offer selectable mist levels like low or high. However, unlike cool mist, they don’t typically offer a finely adjustable output using a dial control. Instead most have a few selectable fixed levels such as low or high modes. Just as many cool mist models do, many offer an automatic shutoff feature which turns off operation when the water runs out to prevent damage. They’re fairly quiet during operation, although some make gurgling or a slight buzzing sound during operation. Cool mist humidifiers, however, are often still the most quiet you can buy. 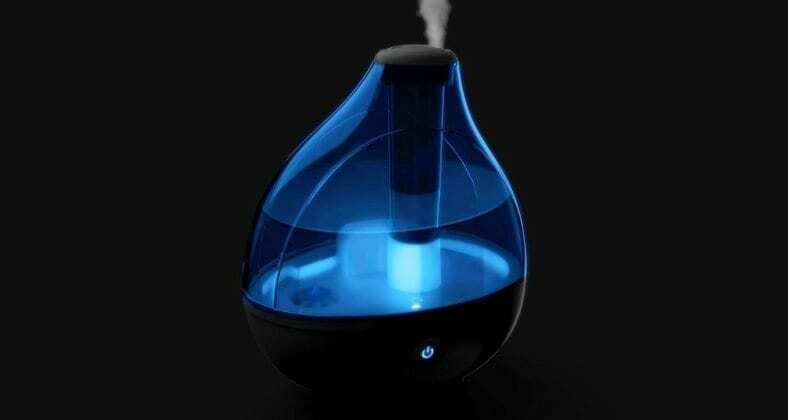 Cool mist humidifiers don’t use heat to change water to vapor. Instead they use electronic or electro-mechanical oscillation to vaporize water rapidly and produce a very fine, cool mist. A great example is this best-selling PureEnrichment MistAire model. It releases a super-fine water vapor into the room at room temperature. 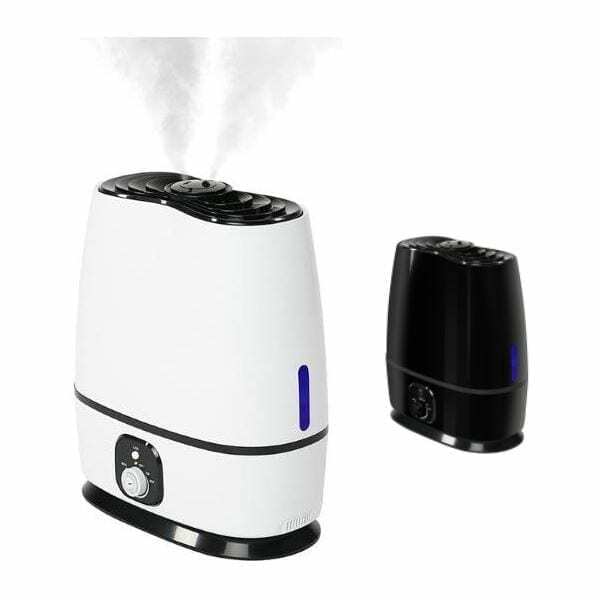 Cool mist humidifiers generate moisture in the air without the use of heat or creating warm steam. This also makes them more energy-efficient as they don’t need as much electricity due to no heating element. 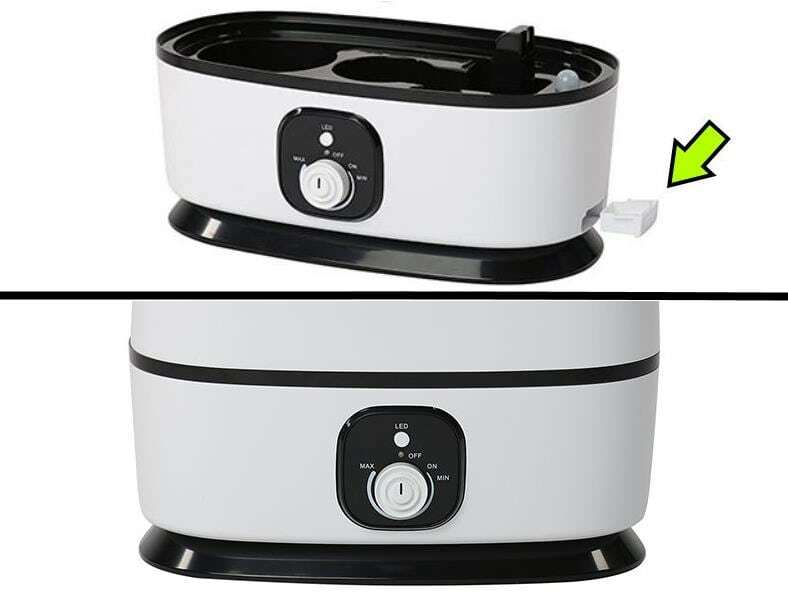 You’ll find two types of cool mist humidifiers although one is a bit outdated and far less common. This first and most common today uses an ultrasonic vaporizer to create mist. Ultrasonic humidifiers have another characteristic aside from not producing heat: they’re nearly completely silent during operation. An example of an “impeller” type. It’s a bit of an outdated technology these days but some are still popular with buyers. These types use an electric motor to turn blades in water and produce a fine mist. The second type, based on technology more common many years ago, uses electro-mechanical parts (often called “impeller” humidifiers). These work by rapidly stirring water using blades on an electric motor that spins. Of the two, ultrasonic models are the most popular and are also far more quiet during use. Cool mist models use less electricity than warm mist models. Additionally, they don’t add heat to a room, so they’re ideal for year-round use, especially in areas with warm and dry climates. On the other hand they’re not as effective in helping to relieve congestion during cold and flu season. Since they create a mist at room temperature (unlike warm mist models) they’re not as ideal for winter and cold seasons. One of the most common questions today is “What humidity level is best for me?” I also hear “How can I check the humidity in my home or office?” at lot as well. Humidity is a measurement shown as a percentage on a scale of 0-100%. It’s a scientific measurement that describes the amount of moisture in the air relative to the air’s temperature. Generally speaking, the human body feels best with a relative humidity above 30% and 60% and below. Severe dry air conditions begin to become obvious at about 30% and below. In dry climates and during winter the level can drop to under 20%! The best humidity level for you is the one that you feel comfortable with and that relieves dry air symptoms for you. A great rule of thumb is to aim for about 50%. When the level begins to reach 30% and below it’s time to run your humidifier. There is not “perfect” range to aim for. However, an ideal range for humidity in your home is 40-50%. Don’t worry about getting the room to steady and exact level. 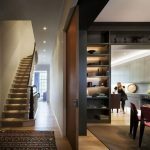 The best approach is to use your humidifier to bring the room’s level to a close level within the recommended range listed here. You might not know it, but the allergy conditions you feel get reduced when a healthy humidity level is maintained. That’s because dry air makes it possible for allergens to spread freely in the air. Additionally, when the mucous linings within your body dry out there’s less defense against air particles as well. If you’ve got the right instrument, keeping track of your home or office’s humidity is a breeze! 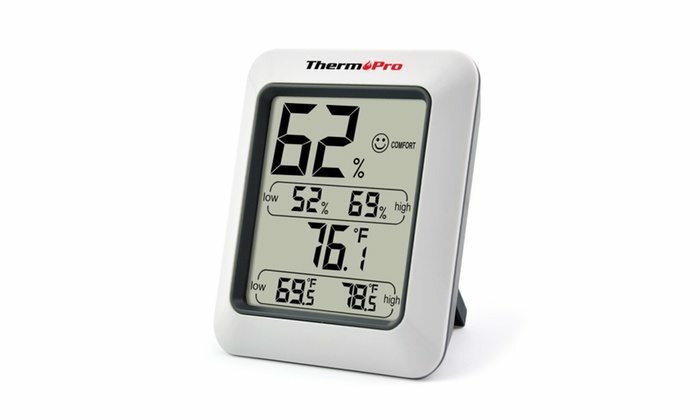 The easiest way is to pick up a gauge like this great little ThermaPro digital humidity gauge. Guessing simply doesn’t work! It’s a terrible way to try to figure out the condition of the air around you. It’s an especially bad idea because our bodies fluctuate in how they sense temperature and dry air. While there are other instruments you can use including using mechanical devices, it’s best to use a digital humidity gauge. As they’re often priced under $15-$10 there’s no reason not to! Where should you put a humidifier? Some tips on where to place a humidifier. Ideally, place it 2 feet or higher above the floor. If that’s not possible you can use the floor as well if it’s not carpeted. In either case I recommend protecting the area around it to avoid water damage. In reality there isn’t a perfect place to put your humidifier. Here are some helpful tips though that work for nearly all models and situations. Ideally it’s best to keep your humidifier a few feet from your bed (say 3 feet or more) or other areas, but not for the reasons you might think. In fact, if you like, you can keep it close to you for cold or sinus congestion relief if you like. As a rule of thumb, a good idea is to keep the humidifier a few feet from your bed or large pieces of furniture. Suffering from severe congestion or cold symptoms? Keeping a warm mist humidifier near the bed can help! Warm mist models create a gentle steam that has a relieving effect similar to a hot, steamy shower. Steam can help release heavy phlegm and from your lungs and nose as well as open breathing passageways. For the most part, humidifiers are very quiet and aren’t very likely to disturb you during sleep if placed a few feet from your bed. As I mentioned earlier, don’t place humidifiers in direct sitting sunlight like near a window. Doing so encourages the growth of bacteria and even algae. 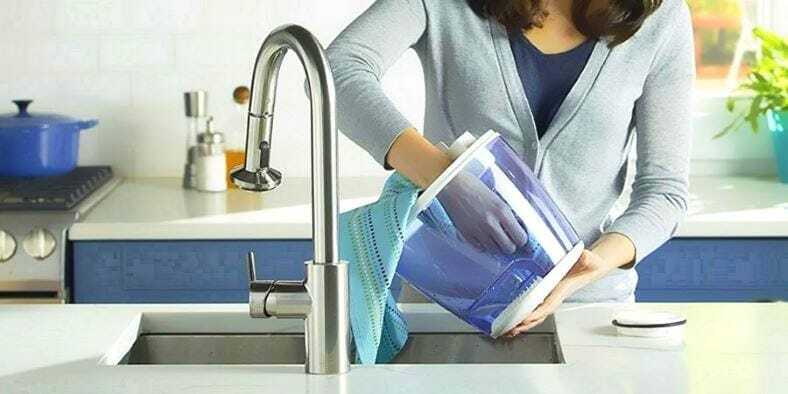 You’ll need to periodically (1 time per week or once every 2 weeks) clean the tank thoroughly with white vinegar mixed with water. A soft, clean cloth can help as well. Using standard city water from the faucet in mine (which has low mineral content) mine works for 1-2 weeks between cleanings sessions. Auto-off & night light too. 2 yr warranty. 1. Pure Enrichment MistAire – A fantastic all-around value and one of the world’s most popular! While there’s no shortage of choices when shopping, the Pure Enrichment MistAire ultrasonic cool mist is one of the best you’ll find under $50. It’s also one of the world’s best-selling humidifiers! Not only is it simple to use, sleek, and feature-packed, but it also brings reliability and a 2 year warranty with it as well. It’s also amazingly quiet and I’ve really loved how peaceful using it is. I really like not only how simple it is to operate but the style and build quality. What’s especially nice is the 360 degree rotating nozzle on the top. Left: Clean up is easy and quick using the included brush. It lets you get into those hard-to-clean areas and save time. Right: With 360 degrees of rotation possible, the unique mist nozzle is a great feature. You can easily adjust the mist direction exactly the way you want for best results. The MistAire provides a 2-level control electronic touch control and adjustable output nozzle. Rotate the nozzle to point the soothing, gentle water mist anywhere you like – there’s a full 360 degrees of rotation available. It’s really easy to use and works well. Like a bit of background lighting when you sleep or for when you get up at night? A nice little night light feature is built in as well. Just switch it on using the push button control. A great night light feature is built-in and I definitely recommend for those with children or adults who like a little glow at night. However, if you’re sensitive to light at night, be aware that even with the night light off there’s still an internal light that remains on. It’s a minor complaint given how good the humidifier. If you’re like me and are sensitive to lights at night, you’ll want to either cover the unit with a quick bit of tape or point it in another direction. The tank isn’t as big as some other models you’ll find, but in my opinion it’s still a great one. At 0.4 gallons (1.5L) capacity, it’s pretty efficient for its compact size. What really blew me away was that I got about a whopping 16 hours of use on 1 refill! In my testing the MistAire did well for relieving dry skin, dry nose, and the usual low-humidity symptoms I suffer from when the air is too dry. When set to the 2nd speed (high) it’s a good performer and before you know it the room’s humidity is back a comfy, healthy level. If you’re wanting an overall winner and great performer for most rooms, this is it without a doubt! The MistAire was a pleasure to use and enjoy. It’s not just the build quality and style that I like, but it’s so quiet I forgot it’s working, it’s adjustable, and it’s easy too clean, too. Take a moment and find out why it's a fantastic choice and best-seller at Amazon. 2. Levoit LV450CH – A fantastic, affordable choice! 36 hour use, one-touch control, and essential oil feature. If you’re wanting one of the most family friendly humidifiers without a filter around, it’s a fantastic choice! The Levoit LV450CH has a lot to offer for an amazing price under $40! I have to admit: I’ve seen a lot of products in my buying and testing, but the LV450CH is one of the best humidifiers I’ve gotten my hands on. You’re going to love it, too! Designed in California, USA, it’s a modern, efficient take on the classic cool mist humidifier. Featuring a 1.1 gallon (4.5L) tank it’s unique in that you get up to a whopping 36 hours of use from 1 water refill. The Levoit features an extremely simple to use design via the single button touch control. Check the remaining water level at a glance with the convenient water level gauge on the side. The one-touch control is very cool and even changes colors for each setting! It’s a really simple system I like. To activate the night light feature which creates a beautiful cool glow within the water tank, push and hold the power button for 2 seconds. 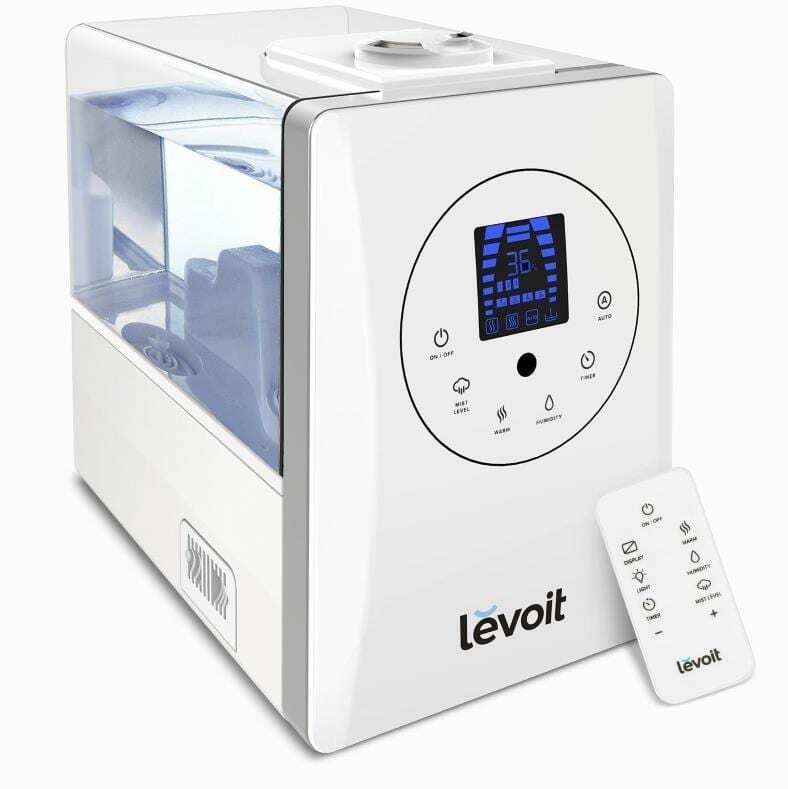 The Levoit LV450CH isn’t only a great humidifier – it’s also a great aromatherapy machine! Just add a 2-3 drops of your favorite scented oils to get an amazingly relaxing fragrance throughout the room. Add some fresh, wonderful scents to your home! 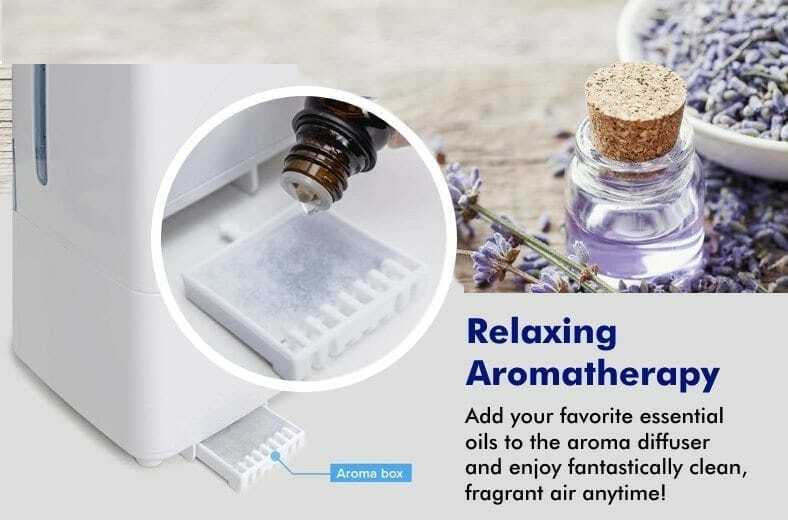 Just slide out the aroma box tray and add 2-3 drops of your favorite scented oil. In a few moments the Levoit will fill the room with a lovely fragrance the really helps you enjoy a relaxing, refreshing environment. It’s also one of the easiest to clean that I’ve dealt with. To clean the unit, remove the tank and you’ll find a handy cleaning brush stored neatly inside. Just wash with white vinegar and water, using the brush if needed. Rinse, refill, and you’re ready to go! 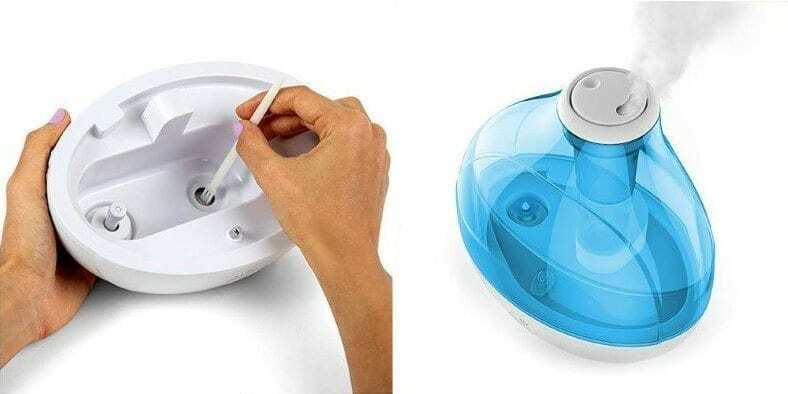 Once water runs out the unit will shut off automatically and the button will glow red so you’ll know it’s time to refill it. As it’s so quiet during use (I could barely tell it’s working!) 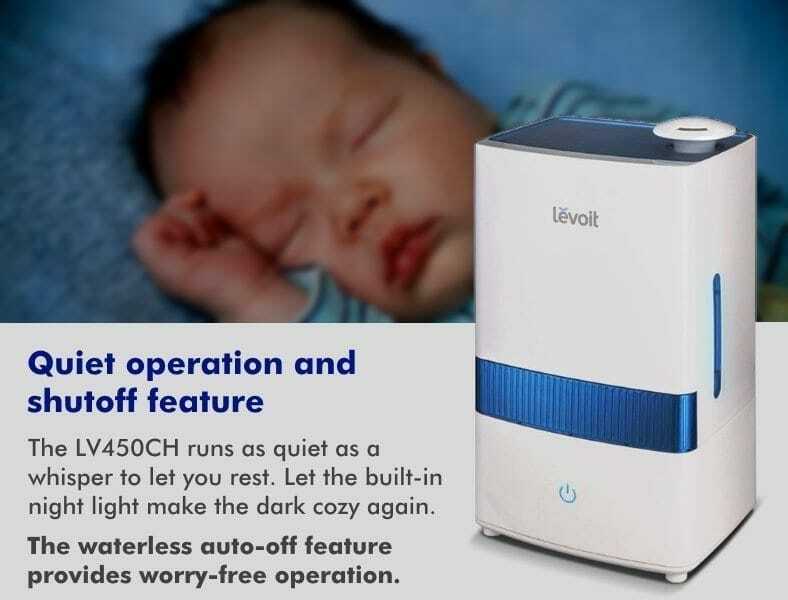 the LV450CH is a truly great cool mist humidifier for babies. The night light (inside the tank) has a soft glow that isn’t too bright. Additionally, when water runs out it will shut off silently & won’t disturb your little one. One thing that I love about it too (aside from the excellent time between refills) is how amazingly quiet it is! It’s great – truly whisper-quiet, making it a perfect choice not just for adults but babies, too. Unlike some other models I’ve tried the night light is gentle and not too bright. There’s no need to worry about waking your or your loved ones up. Up to 36 hours worth of operation on one tank is amazing! It’s also well-made, easy to fill or clean, and a well-rounded design that keeps hassle to a minimum. It’s also one of the best values at under $40. Take a few seconds and find out why it's one of the best cool mist values at Amazon now. 3. 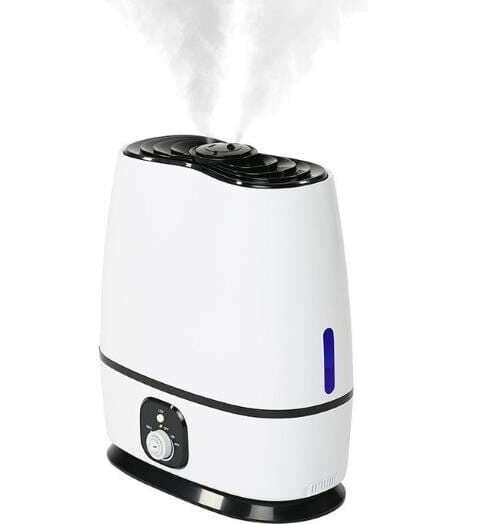 Everlasting Comfort Cool Mist Ultrasonic – A fantastic large room humidifier with aromatherapy support. Love a great combination of value, style, scented oil use, and fast, adjustable dry air relief? The amazing Everlasting Comfort Cool Mist Ultrasonic humidifiers are the perfect solution. At about $65 or less they’re an excellent performer with great features. Pick from two colors: traditional white or a classy, sleek gloss black. It’s one of the best performing and most energy-efficient cool mist humidifiers sold today. Not only that but the aromatherapy oil feature is one of the easiest to use and works fast. The Everlasting Comfort’s water tank is a large 1.6 gallon (6 L) size, providing an amazing 24 hrs of use on low. The side-located night light adds a nice touch when you need more light in the dark. It’s especially useful for those with children or who get up during the night. The water tank, on top, holds a huge 1.6 gallons (6 liters) of water for up to a whopping 24 hours of use between refills. For ease of washing and refilling there’s also a built-in handle on it as well. As far as humidifier tanks go, it’s one of the largest I’ve seen in a humidifier this size and in this price range. Top: Just slide out the aromatherapy oil tray and add a few drops of your favorite scent for a room-filling fragrance experience. Bottom: The controls are very simple but allow great humidity output level control. I love the adjustable dial control and LED light. (The LED switch controls the night light feature). As sleek as it is, it’s also extremely easy to use, too! On the base is a simple and useful adjustable mist output dial. Just turn it for as much (or as little) humidification you want. It also rotates all the way for the on/off function too. Push the “LED” switch right above it any time you like to use the convenient night light on the side. It’s very basic control setup – and in my opinion that’s a good thing! The controls are hassle-free and you can just set it and forget it – then go about your business. A sleek-looking black model is available as well – it’s a great match for many homes and modern apartments! If you’re tired of boring white appliances give it a look. Love fragrances? Save money and make your home or office both fresh and relaxing. Just slide open the scented oil tray, add a few drops, and in minutes you’ll be enjoying great scents. 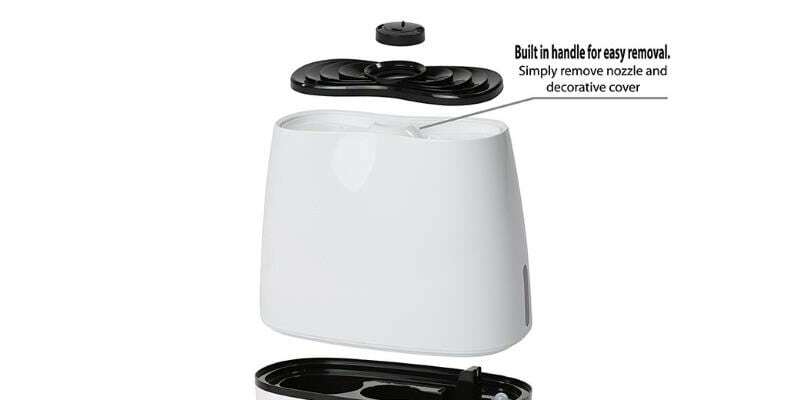 The Everlasting Comfort’s internal fan provides fast airflow to circulate the scent throughout the room quickly. It’s a lot more cost-effective and healthier than incense sticks, candles, and wax warmers. At close to $60 it’s not the absolute cheapest you’ll find – but it’s one of the best! For the quality, fast operation, adjustable output, and long run time you’ll get it’s a great choice. Head over now to see the current price low price and thousands of happy buyer reviews at Amazon. 4. 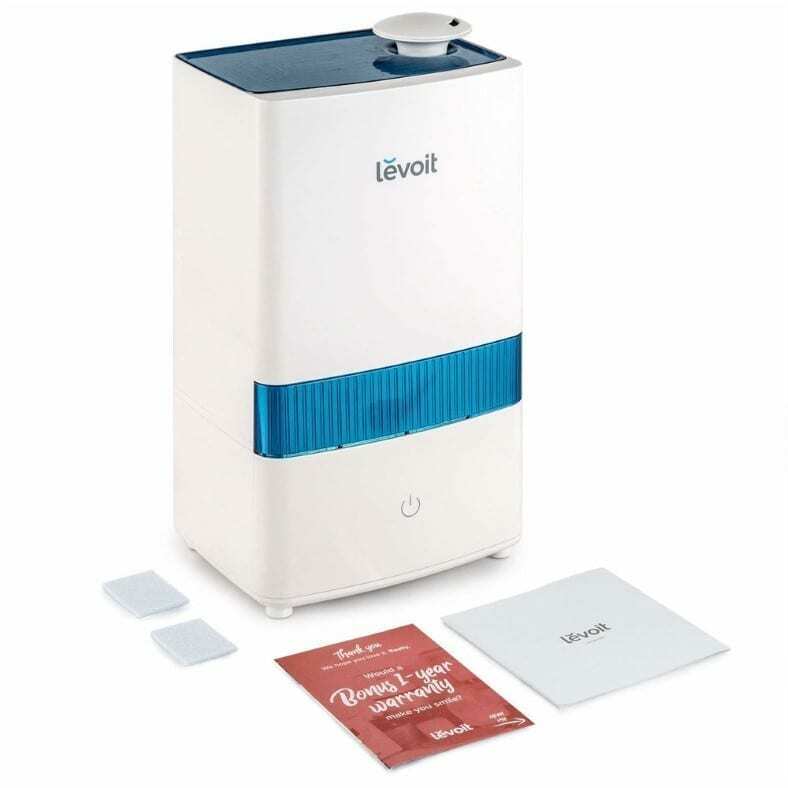 Levoit LV600HH Ultrasonic Hybrid – A dual-purpose large room humidifier with above-average features and ease of use. With the excellent display, features, and dual-purpose warm mist/cool mist design, you might think the Levoit LV600HH isn’t affordable – but it is! 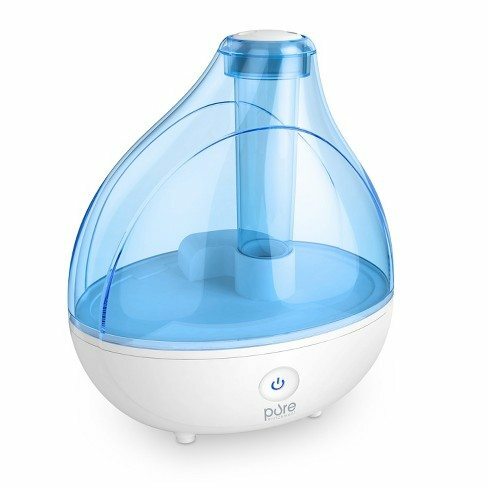 For under $120 you’ll get one of the absolute best and most convenient humidifiers available today. 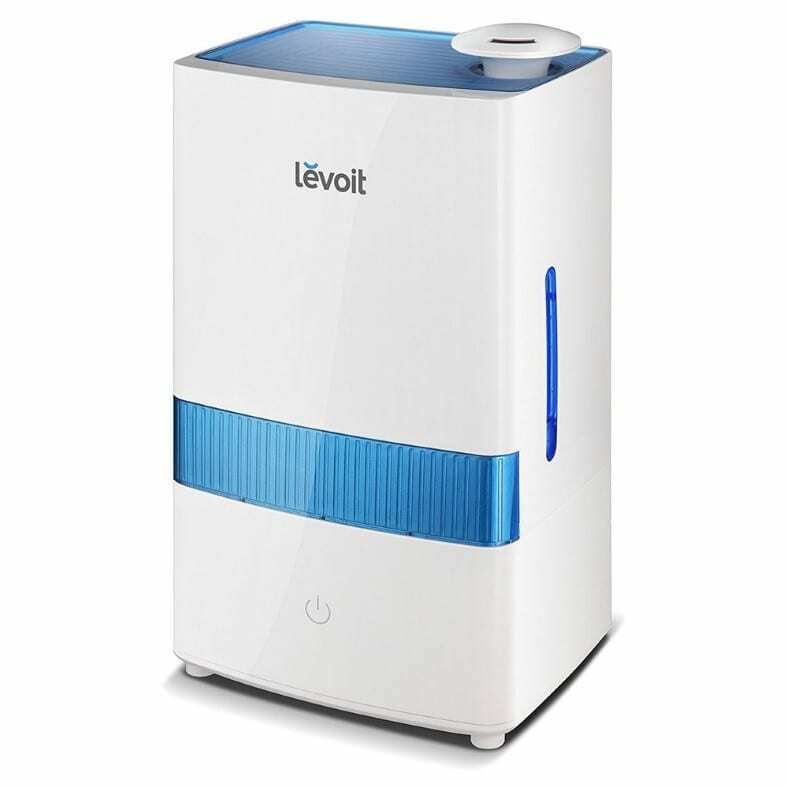 Based on their other successful air quality technology designs, Levoit has taken dry air relief to the next level. With the LV600HH you’ll have cool mist or warm mist humidification at your fingertips year round. Thanks to its computerized electronics the LV600HH can automatically keep up perfect room air humidity where you live. 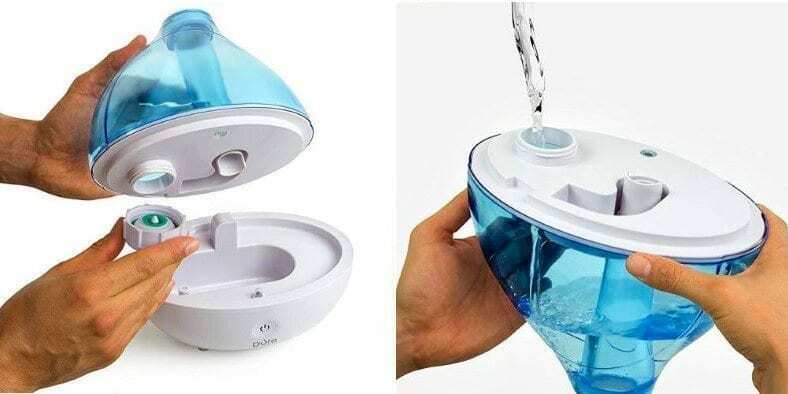 It looks – and works – like a more expensive humidifier! A clear, easy-to-read digital display shows you the current humidity level and working mode at a glance. The front-facing electronic control panel keeps everything together in one place. Clearly marked touch buttons switch modes easily and quickly. Use the handy remote to control it from across the room as well. The controls work well and aren’t over-complicated in my opinion. I like it. The included remote control works well and works from about 25 feet away lets you control all functions without having to get up. While the remote works great, it uses flat “buttons” although I generally prefer raised buttons instead. However, that’s a very minor gripe. One on side of the base is a small sliding tray which lets you add aromatherapy scented oils. Adding a few drops lets the unit quickly create a nice-smelling aroma in the air. It’s a nice little feature that works well and can help you save money and time as there’s no need to use a diffuser as well in that case. Although it’s one of the best money can buy, I do have a few complaints. For one thing, occasionally I’ve noticed the humidity meter isn’t as accurate as some digital gauges I use. Additionally, there’s no built-in like you’ll find in less expensive models which is a disappointment. I’m not sure why, considering how little of a cost that adds to the product. Those are some very minor quibbles for an otherwise excellent humidifier and the company’s top-of-the-line model. It’s a great performer and takes air comfort to the next level. Perfect for a large room and even you whole home, this one’s a definite “Yes” in my opinion! 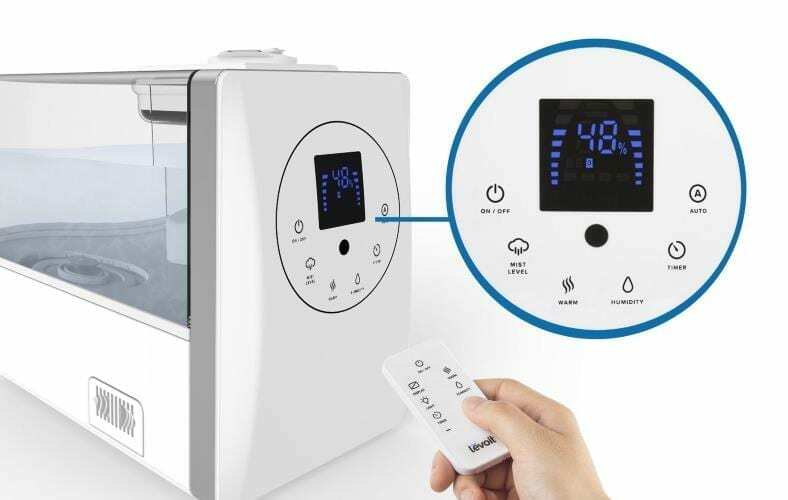 While it’s more expensive than your more basic models at under $120, you’re paying for fast humidifier output, automatic hands-free operation, a built-in digital display, and remote control. The fact that you can switch between cool and warm mist most is extremely useful, as it’s ready for year-round use regardless of the climate or temperature. It’s an excellent choice if your budget allows. Be sure to find out why it's one of the best on the market and a top seller at Amazon today. Want to learn more about humidifiers? 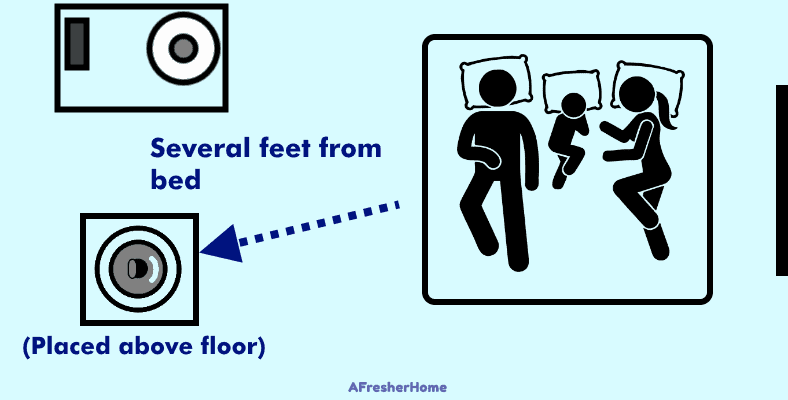 Check out my great guide for what you need to know about having a humidifier close to your bed. For parents, here’s a helpful post to help you decide between a humidifier or air purifier for your child.